St. Francis of Assisi's Catholic Church is located along Oxford Street, in the inner city eastern suburb of Paddington. 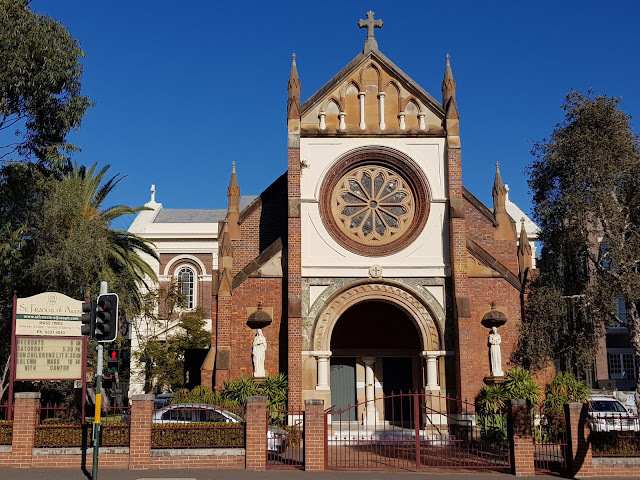 This heritage listed church was designed by John Bede Barlow and built in 1890 in a combination of Victorian Academic Gothic and Victorian Romanesque architectural styles. Additions were made in 1915, designed by Bart Moriarty. That window would no doubt be quite something from the inside. A very distinctive church. BTW, it was trying to comment on the Chrome browser that made it impossible for me to leave comments. Only took me a year and a half to figure that out! Thanks, Paula. Maybe some others who have trouble commenting will now know to try another browser. I'm impressed with that big window at the top! ...lovely. I'd like to see that rose window! There is a St. Francis of Assisi in Lake Chapala Mexico with a statue of St. Francis. There are two statues of saints on the facade. I wouldn't be surprised if one of them was St Francis. Beautiful church! Used to be my favorite Saint when I went to church. It is a gorgeous building. Long may it stand. Nice. I'll bet that rose window is beautiful inside.